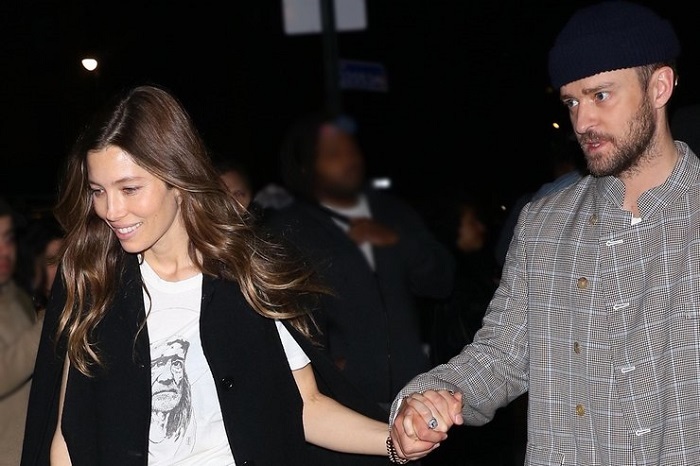 Justin Timberlake went on a date with his wife, 37-year-old Jessica Beale. Star couple rarely comes out and tries to avoid journalists, buy reporters took a few shots with the singer and actress. Justin and Jessica had dinner at Catch Restaurant in New York. Timberlake was in jeans, a t-shirt and a checkered jacket. Bill also picked up a casual look for a date: black pants, white t-shirt and vest and completed look with orange bag. Spouses left the restaurant, holding hands. Justin was unhappy with the paparazzi's attention, while Jessica smiled. Now she travels with Justin Timberlake, supporting him on the Man Of The Woods tour.